Well, would you look at that! 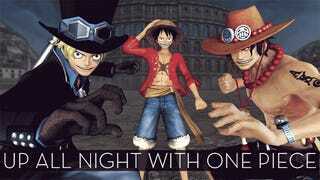 It’s once again time for Luffy and the crew to lay waste to thousands of pirates and marines as they sail the seven seas looking for adventure and treasure—only this time on the PlayStation 4. One Piece Pirate Warriors 3 was released in Japan on March 26, 2015, for the PlayStation 3, PlayStation 4, and PlayStation Vita. It is scheduled for a Western release in August 2015.